During the Fall of 1946, Robert Adams arrived by train to the town of Tiruvannamalai, a few miles from Arunachala Mountain, where lay Ramanashram and his future teacher, Ramana Maharshi. He took a bullock cart to the Ashram, was admitted, and stayed the night. Early the next day while walking back from the mountain, towards the Ashram, he spotted Ramana walking down the path towards him. An electrifying energy coursed through his body, and the last of what men call an ego left him. He felt completely surrendered, completely open. 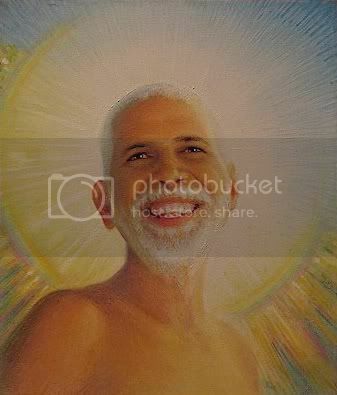 As Ramana got closer, Robert stripped off his clothes, approached Ramana and dropped to his guruâ€™s feet. Ramana reached down grabbing Robert by his shoulder, and looked into Robertâ€™s eyes with complete love and said, "I have been waiting for you. Get up! Get up!" Robert said had Ramana asked him to leap over a cliff at that moment, he would have done so gladly. Robert became different when he told this story. Most of the time he never talked about his past, and when he did, it was said more for entertainment than for teaching purposes. When he told this story he was sitting erect, almost standing out of his chair, and he looked outwards, above the crowd before him, almost as if he were seeing Ramana again. Tears came from his eyes as stated he would have jumped off the cliff for Ramana, and he added finally, "This is how you have to be, completely naked before God, completely surrendered!" articles by him/about him in David Godman's blog. Robert Adams was a great sage. Unfortunately by the time i began to learn about reality, he had already left the body however, there is a website devoted to him which contains rare recordings of satsang, his writings and also a great deal of background information. His explanation gave me a much deeper understanding and i am incredibly grateful to have heard his words as if i was sitting by his side at satsang. The site is called www.itisnotreal.com and i highly recommend it to those looking to learn more about Robert. Robert Adams impressed me greatly. I highly recommend his book "Silence of the heart". I think he would be a good introduction to Advaita thought for westerners that may have a hard time with sanskrit words and complex terminology. that many recent so-called neo-Advaitin teachers seem to fall into. He displayed a high level of integrity that I don't see very often in modern teachers. That's not the book "Silence Of The Heart". That's the screenplay that was taken down. I have read some previous writings from Ed Muzika about Nicole's problem with him using information and recordings of and about Robert. I wonder though, how does one go about getting copyright for truth? Asking a question about "How can you copyright truth" that way is clearly stacking the deck. It's like saying: They used the color blue on the cover... how can they copyright blue? You most certainly -can- get a copyright on your -specific- written or recorded work. Robert asked his wife to protect his work, and now she is. How is this a problem? Perhaps another question worth asking would be: Why is this a problem for Ed Muzika? Why is he spending so much energy publicly disrespecting them? If the material is copyrighted and this is the way Robert wanted his legacy set up, then why shouldn't Ed respect that? is presented by a person, a scholar or a Jnani is a copy right. of Sri Sankara or a Zen Monk in his works? I like Him, He said the "stone to death" Truth which many avoid saying, of course for a reason. This is not just a quote, this is a film script "biography" of Robert's life written by someone who Robert's wife says really wasn't around to know what they were writing about. Big difference than just quoting someone. I'm wondering if a similar experience happened with Bhagavan Ramana Maharshi? Isn't Bhagavan's material (Or sanctioned material about Bhagavan written by someone else) copyrighted? If you wanted to write a book (Or a sceenplay) about Bhagavan wouldn't you get in touch with the center? If they told you not to publish the material you had.... would you publicly throw a fit saying all kinds of derogatory things about them online? ...or for that matter has this already happened with Bhagavan Ramana Maharshi?